Whew!! With temperatures during the day nearing triple digits and evening temperatures cooling off to a muggy high 70’s to low 80’s, we have had a hot couple of days. While the heat is a nice alternative to the typical rainy Washington weather, it can make it difficult to get things done, uncomfortable for people not accustomed to the heat(almost everyone in the NW) and it ultimately poses a dangerous risk for our elderly loved ones. While anyone is at risk of suffering a heat-related illness, the Center for Disease Control reports that older adults are particularly vulnerable because they often do not adjust well to sudden changes in temperature, may have an already existing condition or may take a prescription medicine that affects how the body adjust to temperature. Furthermore, according to research conducted by the University of Chicago Medical Center, over 40% of heat-related fatalities in the United States were among people over the age of 65. Considering it isn’t even summer yet and we have already had several days over the 90’s, it looks like it is going to be a long, hot and dry Summer. Despite the heat, with the right precautions, it is still possible for your elderly loved ones to safely experience all the usual Summer fun. 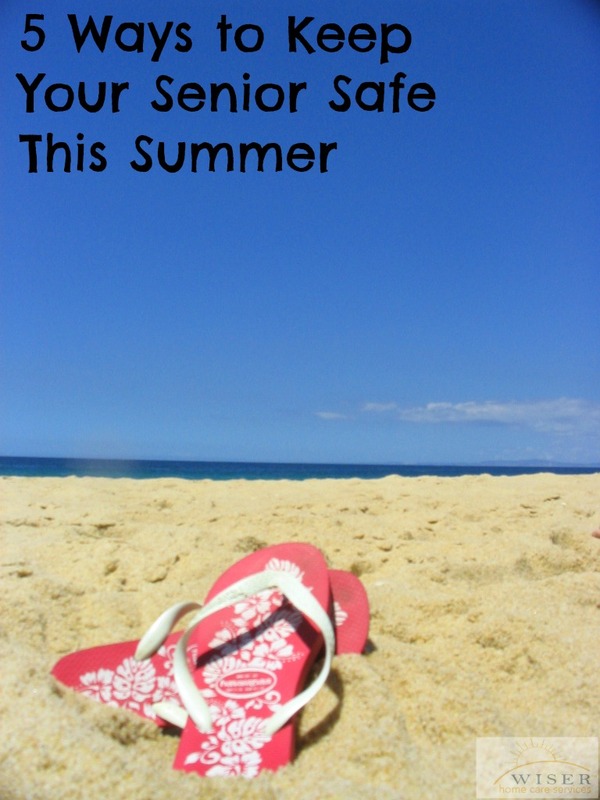 To help you prepare for a fun-filled safe and hot summer, we have compiled some elderly summer safety tips. We hope you enjoy them! Keep an eye on the upcoming weather for potential heat waves. In the midst of a Summer heat wave, make sure you plan your activities and errands around the weather. If you must be outside, try to complete these activities in the morning or evening hours when it is cooler. Try to keep doors closed, lights dim and fans/air conditioning on. If you are still having trouble staying cool enough, there are many public places that have AC and welcome seniors during heat waves. We recommend checking your local library or senior center first. In the hot summer months it is even more to drink plenty of water because most heat-related illnesses stem from dehydration. Experts recommend giving seniors sweat-replacement fluids that contain salt and potassium to make up for the lost fluids due to heat. In addition, when taking medication, your elderly loved one should drink 8 oz of water. You should also stray away from caffeinated beverages such as coffee. These beverages often diuretics and deplete our bodies of necessary fluids. Dressing appropriately for the weather is important. We recommend dressing in layers since sitting in an air-conditioned building can get cool. This will allow your elderly loved one to keep a moderate body temperature without getting too hot or cold. Since hot weather poses such a risk to the elderly population, it is important to keep lines of communication open. Make sure to check in with them frequently. Not only will this give you peace of mind and a chance to remind them to stay hydrated, they will love the company. A common side-effect of aging is the degradation of vision. The bright summer sunshine will not only irritate your eyes, it can also speed up the loss of eyesight. Always keep a pair of sunglasses close when you plan on going outside. In addition, don’t forget to use some sunscreen to protect their skin from harmful UV rays. Now that you have an idea of how to stay safe this summer, go out and have fun.